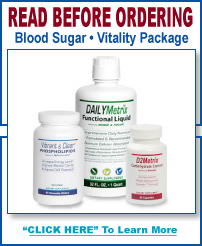 Whether you are using D2Metrix Plus to take control of blood sugar issues or to reduce weight, the two issues are closely related and D2Metrix Plus can help address both issues simultaneously. It has been known for decades that extracts of certain plants with certain molecules affect sugar metabolism. One of the most effective is Chlorogenic Acid extracted from green coffee beans, which has been shown to inhibit the breakup of starch into glucose. This makes the calories in starch less available to be taken up by the body. Chlorogenic Acid actually goes to work when you eat. It buffers the enzymes that break starches down into glucose, which means less sugar is released from food and absorbed by the body. Once glucose is in the system, Chlorogenic Acid moves it into tissues, such as muscles, where it provides energy and muscle growth. Other molecules from plants have been shown to have positive effects on carbohydrate metabolism at different control points, such as opening the micro doorways in muscle tissue so that glucose can enter. Quercetin has been shown to be one of the most effective at this. The primary metabolic pathway inhibition mechanism of quercetin is to cause GLUT2 transport inhibition, which slows glucose absorption from the gut. Another mechanism of quercetin is to cause glycogenolysis by lipid hydrolysis, which releases glucose from adipose tissue. The third mechanism of quercetin is to inhibit fatty acid synthase (lipogenesis), which reduces the body's ability to store glucose as fat. Chlorogenic Acid and Quercetin help maintain a healthy balance of blood sugar so it doesn’t spike too high or dip too low. Myricetin has been proven to have potential for the management of non-insulin-dependent diabetes, by stimulating the uptake of glucose without functional insulin receptors. Myricetin slows down the transportation of sugars and works very well together with quercetin when it comes to the reduction of fat development. Myricetin is also a potent anti-oxidant and carries anti- inflammatory properties that will reduce toxins and free radicals in your body that normally would destroy healthy tissue, weaken your immune system and slow down your body’s fat burning abilities. 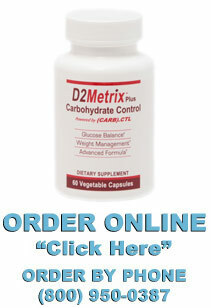 New to the D2Metrix Plus formula is Alpha Lipoic Acid. We added ALA because it is used in every cell, where it helps turn glucose into energy. Overwhelming evidence now suggests that ALA may be critical for not only maintaining optimal blood sugar levels by helping the body to use glucose, but also for supporting insulin sensitivity. ALA is both fat and water-soluble. That means it can work throughout the body.